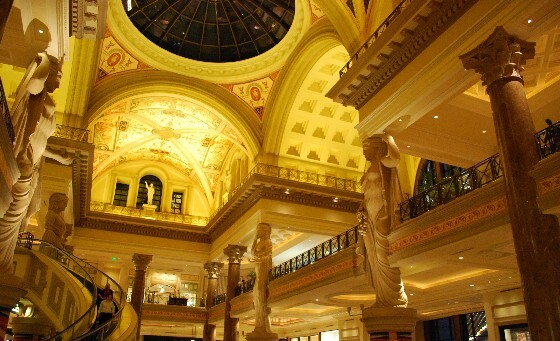 The Forum Shops – This is one of the biggest shopping centres on the strip and you’ll find it at Caesars Palace. The main entrance above is located directly on the strip, at the northern end of the Ceasars plot. There’s also a second entrance at the rear of the Forum Casino inside Ceasars gaming floor. There are 3 floors of shops at the main entrance, but most of the shopping is on one level. There are also two “performing” water features inside. The Shoppes at the Venetian – Walk through the main entrance of the Venetian and you’ll discover a whole array of shops inside, along with re-creations of St Mark’s Square and the Grand Canal complete with Gondola rides! The shopping centre continues into the Palazzo next door with designer outlets like Jimmy Choo over 2 floors. Miracle Mile Shops – Head to Planet Hollywood for a real surprise. A whole mile of shops stretching round the perimiter of the hotel plot and emerging again onto the strip. There are restaurants, coffee shops, clothes outlets, designer stores and souvenier shops here. Also, look out for the water feature with an indoor rain storm which is fascinating to watch. The Fashion Show Mall – Half way down the strip, opposite Wynn is the Las Vegas Fashion Show Mall with 250 outlets covering clothes and beauty. You’ll find department stores like Saks Fifth Ave and Macy’s inside. Crystals – This is the newest shopping experience in Las Vegas at the City Center development. Some of the biggest names in fashion are inside and it boasts luxurious airy walkways.